Our favorite zombie Angel Crawford has come a long way from her days as a pain-pill-addicted high school dropout with a felony record. After a year highlighted by murder, kidnapping, and the loss of her home, all she wants to do is kick back, relax, and maybe even think about college. But when unexpected danger threatens to destroy her, all the brains and bravado in the world may not be enough to keep her from going to pieces. This series is now four books in, and I’m still not fully sold on the Saberton vs. Zombies story line however, Angel’s wacky antics and Allison McLemore’s engrossing narration more than make up for any plot shortcomings. I really enjoyed Diana Rowland’s snark in this latest installment, and the secondary characters were extremely well fleshed out which both went a long way in distracting me from the inescapable brain eating ick factor. The on-again-off-again relationship between Marcus and the heroine is also another sticking point for me. 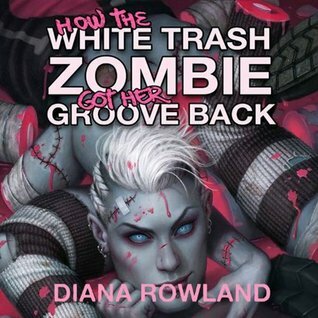 But in the end, the author’s firecracker of a protagonist and killer sense of humour tipped HOW THE WHITE TRASH ZOMBIE GOT HER GROOVE BACK into 4 star territory. Angel Crawford is quickly becoming one of my favourite protagonists to listen to in audio. In this installment she’s attempting to master jujitsu by trash-ifying the terminology (i.e. osoto gari becomes Trip the Drunk Guy), learning how to punch without breaking her hand (while holding a beer! LOL), and FINALLY putting Marcus in his place (hopefully for the last time). Angel is also one of the rare heroines who’s character growth is obvious from book-to-book; she’s come a long way since MY LIFE AS A WHITE TRASH ZOMBIE, and is taking steps to help ensure that her forward momentum continues. The ending of this book did give me some cause for concern though; Crawford’s zombie state practically cured her of her addictions overnight, but the discovery of mods might soon change all that. This audiobook wasn’t available in Canada through my usual go-to retailers which left me scrambling for a copy on release day. Normally, in cases like this I’d hold a grudge and postpone buying it out of spite, so it’s definitely a testament to Allison McLemore’s talent as a narrator that I went above and beyond to snag the audio version. I just could not wait to get my grabby hands on this one! McLemore’s Southern twang is perfectly suited to Angel’s POV, her character voices are distinct and memorable, and she delivers all of Rowland’s punch lines with finesse. There’s even a hat tip to audiobooks in this installment when the author references PASSION OF THE VIKING, Crawford’s current listen, which I loved! Allison McLemore and Angel Crawford is a match made in heaven. Zombie superpowers ACTIVATE! Was this review helpful to you? If so, please consider voting for it on Amazon and GoodReads! I’ve read Ms. Rowland’s Kara Gillian series and quite enjoyed it (I haven’t read the latest book though) but I haven’t given this series a try. Mostly because of the zombies – ick factor. 😉 Perhaps if I listened rather than read I might enjoy it more? It sounds like a lot of fun and I adore a snarky heroine. I was a little grossed out when I first started this series, but now Angel eating brains is no different than a vamp sucking blood. No it’s already book 4? I don’t know but I was sure we were only at book 3, lol now I really have a lot to catch up, it’s dispressing sometimes to realize we’re late everywhere. Yup. Book 4, so you’d best get on it already before you fall too far behind! The cover of this one is my fav to date; I can’t wait to see what book 5 looks like! Fingers crossed for a reveal real soon. My bookshelf needs this series bad!!! I want snark and even if her romantic relationship sounds angsty, I think her snark and humor will more than make up for that! I do like zombies, but if I base it on the title, I wouldn’t even try to read this, but based on your review, it sounds awesome! I think doing it on audio is so much better, too. Fantastic review, Carmel! I freaking love those covers – the cover artist is up for a HUGO this year. I have a hard choice ahead of me votewise for artists. Anyways I’ve always wanted to read this series and a firecracker sense of humor is definitely something that sounds appealing. Nice! I hadn’t heard about the HUGO nomination yet; it’s always a tough choice deciding who to vote for. Awesome review Carmel! And you’re a totally right, Allison’s narration is so good to the point that that made this book alright for me. I don’t think I’d would have finished it if I read it. I’m pretty sure is not the book, is just me, I was totally uninterested after having anticipated this so much. 🙁 and it bums me out. It wasn’t just you, it was me too. LOL I’m not diggin’ the story line, but Angel and McLemore are impossible to resist! I like snark in a book, especially when it can take my mind off of icky brain-eating. That cover has me queasy though. Great review, Carmel! Zombies are definitely an acquired taste, and if just looking at the cover makes you queasy, it’s probably not for you. Thanks for stopping by! Okay I admit, it does say a lot if any author can distract you from plot holes with good witty banter and well fleshed out characters, both main and secondary. The plot is usually a pivotal element for me, so it speaks volumes that the characters & humour are able to make me overlook such a key ingredient. I just skimmed your review because I’ve only read the first book in the series yet, but I didn’t realize there were four books out-for some reason I thought it was a trilogy. I’d like to continue with book two, but for some reason my library only has the first book grrrr. Book 1 is still my fav to date, but hopefully your library gets the rest of this series real soon! I think I kept my review pretty spoiler free, but yes, get back to listening already! The scene between Angel & her sensei is hilarious! Yes, I’m so glad you guys are great about no spoilers! I agree, but it was still good for a laugh. Frikin’ hell! I can’t believe I still haven’t started this series. UGH. Must do that soon! Playing series catch-up is a game you just can’t win, but that doesn’t stop us from trying! I’ve only read the first book and have been curious about these on audio. I might have to do the rest on audio. I have to admit, I’m not sold on the world yet but I do love those characters! I’m not sold either, and this is book 4. I’m thinking of trying her other series to see what that one is like. I always wanted to read this series, but for some reason I am reluctant. Many people like it, but I guess I never see anyone amazed by it, you know? The first installment was a 5 star listen to me, but everything else since had kinda fallen short. They are still good books, but are missing the wow factor. I’ve heard a lot of recommendations about this series and I think I would love it! I absolutely love zombies and The Walking Dead and this one just seems like lots of fun. The zombies are mostly ‘good’ in this series, so it’s not very similar to The Walking Dead in that respect, but at least that means that you’re not grossed out by brains, so you’d probably get a kick out of these books. OMG I LOVE Allison McLemore reading Angel!!! The voice she uses is exactly as I imagine Angel would sound like and she makes the series such an enjoyable listen. Nick has really grown on me over the course of the series. He’s really got me intrigued after the little bit of time we spent with him in book 4 and I hope we get more in #5. Nick was kind of a snob in the earlier books, but I really like him now as a match for Angel. Hell, anyone has to be better than Marcus. What a tool! LOL He just keeps making the SAME mistake over, and over, and over… URGH! I grabbed the first of the series when it was an audible daily deal. Looking forward to starting it. I LOVE Renee Raudman! I only listen to Ilona Andrews’ book now; reading them just won’t do. So glad to know you enjoyed this! The covers are really eye-catching, and the titles as well. I really like the sound of the narrator! Narrators usually make or break a story so I’m glad she made it better. These books definitely stand out in the paranormal genre; I like how different they are. Wow, just the title has me ready to read it! It sounds snarky, I love that. I might have to check these out! Thank you! I love a catchy title! Molly Harper’s are also among my favs. This is a fab series to listen to; I think you’ll get more out of it in audio. I haven’t had an urge to read this series at all but I have been enjoying UF on audio so I might consider listening to it if I were to find the first for cheap or something. I’m glad you did enjoy this! Once you meet Angel, you won’t be able to quit! I’m so behind on this series, but really enjoyed book one. Can’t wait to catch up! Characterization is very important in my book so it’s great that the characters are well fleshed out in this series. It’s the first time I’ve heard of it but it must be great if it’s the fourth one and you’re still loving it! I’ve dropped a lot of series over the years because I lost interest in them, so I’m glad you enjoy this one. Great review! Series burn-out is hard to avoid, but I’m happy to report that this one is still going strong! 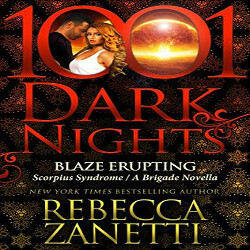 I love this series, but haven’t had time to read this one… and now, after reading your review, I don’t know if I should listen to the audiobook instead of reading it. Fab review Carmel… Although I get what you mean about the on again/off again relationship. It’s time to pick one way or the other. Sounds like it is a good read and it is nice to see you like the narrator so much. I think I’ll have to give this series a try! I’ve wanted to start this series in forever. I love zombies so I’m not sure why I haven’t.